The first time I had a kite line break on me, I had no idea what to look for for replacement, so I started asking around and doing some in-depth research. So what are the best kiteboarding lines? The best kite lines have a high breaking load of 300 to 500 kg, use high-quality Spectra or Dyneema material at their core, have the highest strength to weight/diameter ratio, and the best abrasion resistance. They are spun, pre-stretched and coated by a leading rope manufacturer. You can get ready-for-use replacement line-sets from most major kite brands, or standard kite-grade line sets from kite parts vendors. Alternatively, you can choose to source line of adequate quality in bulk, then finish and assemble your lines yourself using sleeving and splicing tools. What are the different lines on a kiteboarding kite? What’s special about a good kiteboarding fly line? Which companies and brands make the best kiteboarding lines? How many lines should I replace? Do I need lines from the same brand as my kite? Where can I find branded or standard replacement kite lines? Can I fix a kiteboard line? Can I make my own replacement kite lines? What’s the deal with Q-Power lines? The front lines essentially serve to hold the kite while flying, while the backlines are used to steer the kite and adjusting its power by pulling the back of the kite more or less. Bridles are a system of lines that form part of the kite and are distributed across its length for balance when flying. Bridles play a key role in the kite’s depower and safety system, e.g. when you pull the trim or when you trigger the quick release to flag the kite. 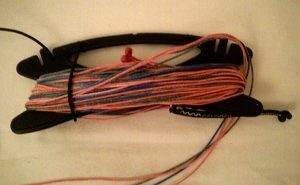 Pigtails are short, thick connector lines with a knot and a loop that connect the lines to the kite bridles. There are typically pigtails at the end of the lines and other on the kite side. Pigtails help prevent the lines and bridles from wearing out too fast due to continuously hooking/unhooking the lines. Quality kite lines are incredibly strong under load, but they can easily get damaged through abrasion, line crossing, shocks (e.g. against a rock), and long-term salt and sand exposure. You should check your lines on a regular basis for cuts, fraying, and abrasion signs. In general, you should replace them as soon as they show signs of wear and tear in order to avoid safety problems. The lines are a component of the control bar and a very important part of your kite setup. Although kite lines look simple, they are actually a very complex and high-tech product, which is why they are so expensive. Kite lines must withstand incredible amounts of tension when kitesurfing, e.g. when performing kiteloops. The force which kite lines are subject to is generally expressed in dekanewtons (daN) or in kilogram-force (kgf or kg for short). One Newton represents the amount of force that must be applied to a 1kg mass to give it an acceleration of 1 meter/s. A dekanewton is equal to 10 newtons. And, one newton is equivalent to about 1.02 kgf (kg for short), so the daN and kgf units are used pretty much interchangeably. 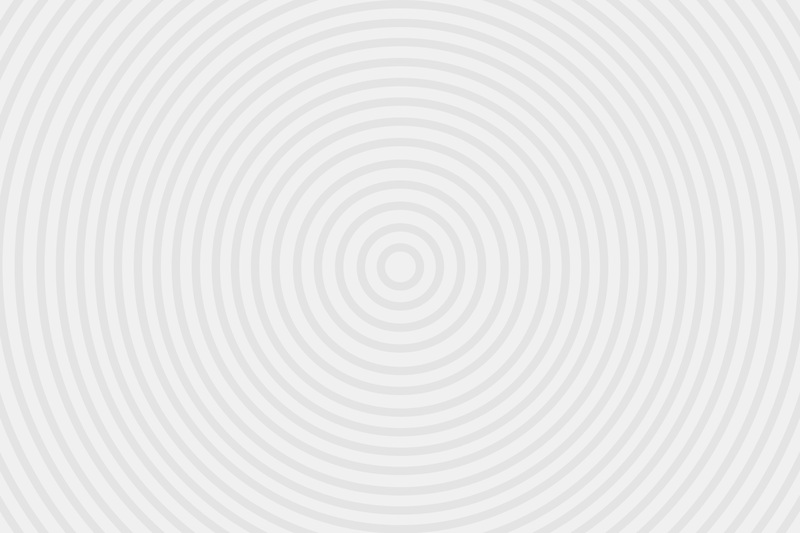 Line thickness (diameter): thicker lines are stronger than thinner lines using the same material. However, thicker lines have more drag, i.e. air resistance, which can affect flying. Race kiteboarding lines are typically thinner for performance although at the expense of durability. Elongation and creep: most kiteboarding lines will stretch under load (reversible elongation) and with time (creep = irreversible elongation). For this reason, both line and kite manufacturers pre-stretch their lines at their factory to try to reduce the amount of elongation during future use. Most of the time, however, kiteboarders still experience additional stretch, resulting in over-sheeted kites. Abrasion resistance: as mentioned, lines easily get damaged from abrasion and sand, so line manufacturers add special coating to make them slippery and less prone to abrasion. The coating is a key distinguishing factor between the different manufacturers. Stiffness and UV resistance: stiffer lines are easier to handle but are more subject to abrasion. UV resistance is obviously an important quality for kitesurfing lines. 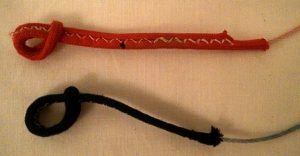 Sheated: kite lines can be encased in a tightly braided sheath, adding to the strength and abrasion resistance of the line but at the cost of a slightly larger diameter (thus more drag). Unsheated lines can be used for certain parts of the kite for performance reason. Two brands, Dyneema and Spectra, lead the market for the production of high-resistance fibers boasting the previously mentioned qualities – load, weight, thickness, abrasion, stretch, and more. Dyneema is owned by DSM Dyneema B.V., a Dutch company from which most European kite manufacturers source. Dyneema is becoming increasingly popular in the U.S as well. Spectra, on the other hand, is a trademark of U.S. company Honeywell. The two companies’ high-tech fibers are both made from Ultra High Molecular Weight Polyethylene (UHMWPE). They are 15 times stronger than steel. In addition to specialty ropes and lines, the fibers have a wide range of applications, including cut-resistance gloves, high-performance athletic gear, bullet-resistant vests, fishing lines/nets etc. Both Dyneema and Spectra are very strong and durable, though they have slightly different molecular structures. Dyneema has a higher breaking load for thicker diameters. Both are lightweight, keep moisture out and float over water. Both fibers have extremely low stretch but do “creep” (elongate slowly) over time under prolonged heavy load. Premium Dyneema grades (DM20 and SK99) have more strength for less weight/thickness and less elongation vs standard “kite grades” (SK75, SK78) but at the cost of higher prices. There are 3 major line and rope manufacturers worldwide, Teufelberger (Austria), Cousin Trestec (France) and Liros (Germany). A fourth one, Eurocord (Netherlands) seems to have filed for bankruptcy. Besides power kite lines, these companies produce high-end specialized rope products for many applications such as industrial, aeronautical, yachting, outdoor (climbing, paragliding etc), safety (work at height etc), automotive, and military cordage. Most of these manufacturers also produce high-end flying line based on premium fivers such as the Dyneema SK99 and DM20. Teufelberger is a supplier for leading kitesurf manufacturers such as North Kiteboarding, Switch Kites, and Best Kiteboarding, among others. Their product range includes all the types of lines, flying lines, depower lines, bridles and leader lines. Liros developed lines specifically for Core Kites and is also a supplier to Zian Kiteboarding. Cousin Trestec, at one point a supplier to Switch Kites, has both Dyneema and Spectra based flying line offerings (both sheathed and unsheathed). These rope companies focus on constantly improving the manufacturing, pre-stretching, and impregnation (coating) process for the lines, regularly coming up with new and better-performing lines even though the fiber material remains more or less the same. In addition to the above companies, Powerline Sports is a “boutique” flying line company which focuses on kiteboarding applications. Read on for more about the Q-Powerline product. Kiteboarding equipment manufacturers are the third and final piece of the puzzle. They source the lines from the above companies and do their own finishing, including line cutting, splicing, and sewing. Companies such as North Kiteboarding devotes a lot of resources to come up with the best way to assemble and set up the lines on their control bars and safety systems. Each company has their own specifications on setting up the lines, which are kept as a trade secret. Kite manufacturers also further pre-stretch lines before assembling them to reduce the amount of elongation they will suffer during their lifetime. While Dyneema and Spectra have very low stretch compared to other materials, they will still stretch some and hence de-tune the kite and trim. In this section, I’ll go over the main options available to kiteboarders for replacing kite lines. Along the way, I’ll suggest a few online places I know of for buying lines you can use out of the box. When one of your kite lines breaks, your remaining lines undergo a lot of stress, sometimes leading to them snapping in a cascade right after the first. Even when that’s not the case, used lines will either stretch under load or shrink over time, so changing only one line will lead to uneven lengths, affecting your kite’s flight. Even lines made by the same manufacturer may shrink at different rates. If one of your lines breaks, you should consider changing all 4 lines, particularly if the others have similar age/wear. At the very least, you should replace your lines in a pair, e.g. both front or both rear lines. Even if you only change a pair, it’s generally a good idea to buy a complete 4-line set and keep 2 spares lines for future replacement use. In case one of your lines breaks cleanly, e.g. gets cut neatly by a piece of broken glass – vs snapping due to wear – you may choose to fix that line only. Doing so requires work because of the differences in length between the new and the used lines. See further down for more. You don’t have to get your replacement kiteboarding lines from the same manufacturer, although doing so will make things easier for you. Before buying lines from a different brand, you need to check if the line lengths, the splices, the sleeves, and the loops and knots are the same as (or adjustable to fit) your kite brand. For example, brands typically have slightly differing lengths for a given announced length, due to different ways they measure the lines – including the bar of not, back line or front line length, whether there’s a V or not and how high, etc. Thus a 24m line will not have the same exact length if it’s a Naish, Ozone or Slingshot. The exact length of a line may even vary for a same brand from one year to the next, due to evolving bar design. Also, one manufacturer may use connection points opposite to another, e.g. knots vs. loops for the back lines. I’ve experienced this problem when trying to use my Cabrinha bar with my RRD Obsession. An easy solution was to add pigtails between my kite and lines – e.g. a loop-loop adapter. Just be sure to check this out before buying finished lines from a different brand, and if necessary, get appropriate pigtail connectors. Even though buying lines from a kite manufacturer may inspire more confidence compared to standard kite lines, what you get is not always clear as many kite brands do not provide much information around the exact grade and specs of the Dyneema / Spectra lines they sell. Good choice of finished standard kite lines: drtuba.eu (Slovenia). E.g. this SK75 Dyneema pre-stretched 310kg or 510kg 2-line set. Set of high-quality Dyneema (Holland grade) lines: this French site. I bought a universal bar from these guys years ago, great quality lines. drtuba.eu offer line customization services in addition to pre-finished lines. They’ll cut and splice your lines to order and ship them anywhere. As mentioned, if a line gets cut clean (NOT as a result of wear) you can typically fix it, or get it fixed, individually. If the break is close to an end, one option is to cut the other 3 lines to match the new length of your broken line – you’ll need to sleeve or splice the new ends of your lines, which requires a bit of know-how. Another option if the break is close to an end is to make a bar leader extension (leader lines are those “pre-lines” that start at the bar and connect into the normal line higher up) for your broken line to make up for the new shorter length. If the break is clean but further from the ends, you can choose to fix your line using a few inches of 12-strand Dyneema line to replace the broken part. Fixing one line, however, requires skill and patience to make the two lines (front or rear) match in length while not weaking the line. What this usually boils down to is learning to splice. Splicing is a technique that allows you to join a line onto itself to make an end or a loop, or to tie two pieces of line together. This is done by “partly untwisting and then interweaving [the line’s] strands” (wikipedia). Fixing a line can come in handy if you’re traveling or time-constrained. In many cases, however, replacing the lines is a better and longer-lasting option. While we’ve seen how you can easily purchase finished replacement lines, many kiteboarders prefer to make their own lines. Why would you want to make your own lines? Well, this approach can end up being somewhat cheaper over time – although it does initially require time, patience and skills. Most importantly, you’ll know exactly what kind of line you have in terms of quality – load, stretch, abrasion etc. Also, you’ll also be able to create new sets on the fly (pardon the pun) with the desired lengths and ends, whenever you need them. Measuring length correctly, taking into accounts your other lines, the knots, and splices you’ll be doing, the connectors, etc. Performing the actual splices and/or knots. The easiest way to finish a line is to use a knot at its end. However, knots significantly weaken a line through strands rubbing against, and cutting through, each other. A common solution is to wrap the line in a braided sleeve which protects the line and makes it easier to tie and untie the knot. Once you learn how to splice, you can fix your gear for only the cost of raw lines and your own time – still not so cheap though, a line set may still cost you around $80 without labor. 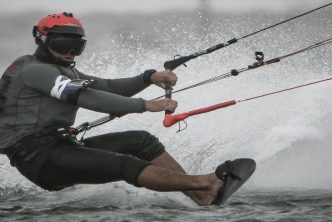 Some kiteboarders use pigtails at the end of their lines to reduce the wear from tying/untying the lines. Also, being sleeved, pigtails can take knots without weakening. So as an alternative to stretching the lines, which can be a tedious process, some riders include longer pigtails in their center lines so when they start to stretch out, they can just add a knot on the pigtails to shorten the overall lines again. Using pigtails in the front lines also makes adjusting length easier in order to match them with the rear lines without cutting and splicing each time around. 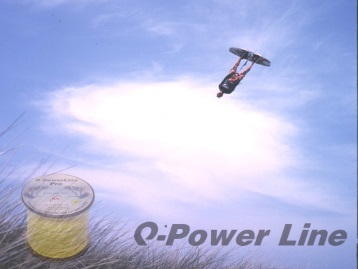 Q-Powerline is a very popular and strong kite line made by Powerline Sports, a Canada-based company which has a unique focus on fly line specifically engineered for kiteboarding. The company’s line has a spectra core – their premium Q-powerline Pro product actually uses a very high Spectra grade. The line core is surrounded with an extremely tight woven braid that bars sand and dirt from getting into the core line material – a common cause of abrasion which shortens a line’s life. Due to its construction, Q-Power has proven strength, longevity, non-tangling quality (due to stiffness), abrasion resistance (special sheath and lubricated coating), and reduced thickness. Most riders agree than Q-powerline, especially the Pro grade, is extremely strong and durable – some claim to have been using the same lines for up to 10 years. But probably the greatest asset of Q-powerline is that, due to its braided sheath structure, you can actually tie knots on it without loss of strength, unlike standard Spectra line, and without additional braided sleeving. On the flip side, Q-power can’t be sleeved or spliced, you can only use figure-8 knots to join the lines together. On the one hand, this is a great advantage as it gives you the ability to purchase a spool and then quickly make new sets of line extensions with knots as needed. The downside is that Q-power lines typically won’t fit through most newer kite safety systems as knots will not slide through the control bar hole or V ring/swivel. For the lower part of the line, you typically need a spliced line – is flatter than a figure-8 knot. For this reason, q-powerline generally won’t work as simple line replacement on a newer quick release system. Kiteboarders typically use standard 12-strand Dyneema/Spectra line through the safety and near the bar, then use Q-power line starting about 10 meters up towards the kite. Nevertheless, Q-powerline is great for quickly making a set of pigtail extensions for use kite side for adjusting or fixing back or front lines with simple figure-8 knots. While some people remain wary of using knots, many do it on Q-powerline without issues. Again, just be sure to check for any compatibility issues with your safety release system. As you can tell from the previous sections, there are quite a few options for choosing the best replacement kiteboarding lines. The most obvious one is to purchase a set of lines from your kite brand, typically the easiest approach, though not necessarily the cheapest. Not all kite brands, however, share much information about the exact grade of material used in their lines. As a result, some kiteboarders source their lines from different kite brands, even at the price of having to adjust lengths and end points, while other opt for quality unbranded line sets. If you have the patience, DIY skills, and/or lower budget, an alternative for getting the best kiteboarding lines is to make them yourself from kiteboarding grade, high-performance bulk line. This, however, requires the most work and involves mastering a few skills such as sleeving and/or splicing. How fast do kitesurfers go? Very informative & helpful thanks. I was actually looking to sort a problem you went straight to: I’m buying a Cabrinha bar with lines to suit a Cabrinha kite. I want it to work with a North kite where the order of loops and knots are reversed. Can I buy loop/loop & knot/knot to reverse the order of loop & knot on the kite as we go from backlines to bridles etc. And where?